NTSB: Preliminary Accident Report on Acton Movie Helicopter Crash, 2-10-2013. On February 10, about 0330 Pacific standard time, a Bell Helicopter 206B JetRanger, N59518, collided with terrain shortly after departing from a landing zone on a movie ranch near Acton, California. Orbic Air LLC, was operating the helicopter under the provisions of 14 Code of Federal Regulations (CFR) Part 91. The commercial pilot and two passengers sustained fatal injuries; the helicopter sustained substantial damage. The local flight departed the landing zone (LZ) about 1 minute prior to the accident for the purpose of shooting an aerial video sequence. Dark night visual meteorological conditions prevailed, and no flight plan had been filed. Eyeworks USA LLC, also doing business as Bongo LLC, production company had contracted Orbic Air to provide helicopter services for a reality television show they were producing. 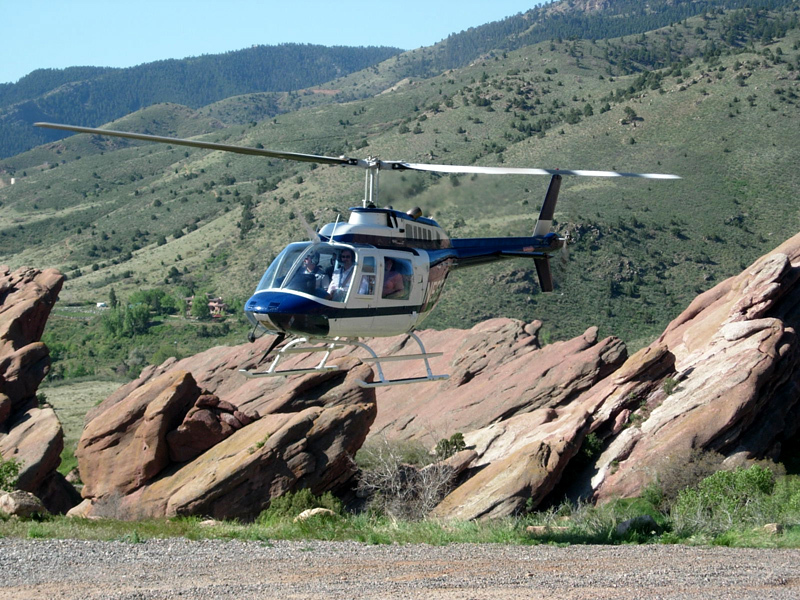 The pilot and several members of the production crew had scouted the movie ranch location a few weeks prior; at which time they discussed the helicopter’s maneuver possibilities, equipment needed, and film planning. Following that meeting, the pilot filed a Plan of Action (POA) waiver with the Federal Aviation Administration (FAA) under his company, Crossbow Helicopters, Inc., and the filming day was scheduled for the evening of February 09. The tentative plan was for an actor to drop a backpack to the ground while the helicopter was in a hover enabling the cameras to film the airborne actor, the backpack receiver on the ground, and the helicopter executing the mission. There were two shots needed of the backpack being dropped, done by two different actors, at two separate locations. The pilot departed on February 09 about 1645 from the helicopter’s base at Van Nuys Airport, Van Nuys, California, with about 55 gallons of fuel onboard and an additional 10 gallons of fuel in plastic containers. The helicopter arrived at the LZ, and about 1730, the pilot conducted a safety meeting with the production crewmembers briefing them of the potential hazards of having the helicopter on-site. The pilot removed the fuel containers and took off the left-side doors. The first bag-drop mission occurred around 2100 and the pilot departed with an actor in the left-front seat and a camera operator behind him in the left-rear seat. The flight lasted about an hour and consisted of the pilot performing several passes and then circling numerous times around a predetermined drop zone (an open clearing surrounded by trees) located a few hundred yards away from the LZ. After circling and dropping the backpack, the pilot returned back to the LZ to retrieve the backpack and discuss the necessary changes in the flight to capture the correct shot. This occurred several times until the production team was satisfied with the footage attained. The production crew and pilot had a catered meal break at 2300 and the pilot slept in a trailer for about 1.5-2 hours. The next filming location was a plateau about 1,500 feet southeast of the LZ. The plateau had a dirt road that paralleled the north-south ridgeline and was where the edge of the west-facing valley wall sloped down about 70 feet mean sea level (msl) to another dirt road. The terrain gradually sloped down from that road in to a north-south oriented valley and dry riverbed that stretched about 1,000 feet to the west. There were no lights in the valley. After his rest, the pilot went to the plateau to view the lighting situation and discuss with the director and other production crewmembers the second, and final, backpacking dropping mission. There were two cranes set up with light directed toward an area of the plateau where the bag was to be dropped. The pilot requested that another smaller light be erected to illuminate the sloping terrain just below the dirt road. He additionally requested that glow sticks be placed in line on the ridge to lead up to the drop zone. Both of the lighting requests were granted and the director and pilot agreed on the scene and maneuvers to be performed. The helicopter would hover at the west side of the valley and then maneuver east toward the plateau. The helicopter would then ascend from below the ridgeline with the left side in view for the actor to be filmed dropping the backpack onto the plateau. After removing frost from the main rotor blades and windshield, the pilot departed the LZ on February 10 about 0330 with the same camera operator in the left-rear seat and a different actor in the left-front seat. The camera crew additionally set up a GoPro camera on the windshield to film the actor and a Flexit LED light pad was placed behind it to aid in illuminating him. Witnesses observed the helicopter depart normally and fly toward the plateau from the west. While maneuvering about 60 miles per hour, the helicopter suddenly pitched down and collided with the terrain below the valley’s wall. The production crew had expected the helicopter to perform high passes prior to maneuvering around near the plateau for the action shot and did not have the cameras on the ground set up or filming. The accident site was located in the soft sloping dirt area at the base of the valley wall with a portion of the left skid tow being the first identified point of impact. Scattered about 170 feet, the helicopter’s debris field was oriented on a 105-degree magnetic bearing. The main wreckage, which consisted of a majority of the airframe and engine, was located about 70 feet west of the edge of the plateau’s ridgeline. The helicopter was recovered for further examination and the visual/audio recording devices were retained and sent to NTSB headquarters.